Death, Taxes and Jagr: A hockey blog: What Can We Expect From Radim Vrbata On The Canucks? What Can We Expect From Radim Vrbata On The Canucks? Radim Vrbata is a 33 year-old Czech forward who has been playing in the NHL since the 2001-2002 season. He has played the last 6 years of his career on the Phoenix (now Arizona) Coyotes at the right wing position (mostly) on the top line paired with centers like Martin Hanzal and Mike Ribeiro, from last season. The 6'1", 194-pound Czech-born, selected by Colorado in the 7th round (212 overall) of the 1999 NHL entry draft, signed with the Vancouver Canucks early in June to a two year contract with an AAV of $5 million. This post will look at Vrbata's playing ability and how well he will fit with the Canucks. Last season, Vrbata scored 20 goals and 51 points in 80 games played. Vrbata's breakout season was in 2011-2012, where he scored 35 goals and 62 points in 77 games played. Over the past 4 seasons (including the lockout-shortened 2012-2013 season), Vrbata has scored 86 goals and 189 points in 270 games played. Vrbata has experience playing on the top 3 lines and has proven himself to be a potential 35-goal scorer in a season. For more possession stats, we turn to hockeyanalysis.com (mainly because ExtraSkater is down) and look at Vrbata's Corsi For% over the past 4 seasons. From the 2011-2014 seasons, Vrbata displayed a 51.8% Corsi For stat. To see whether or not this stat was caused by inflation from a competent, or elite linemate, one can look at two sets of stats: Corsi Relative% and WOWY. Corsi Relative% is a measurement differential of the Corsi For% of a team when the player is on the ice vs. when the player is off the ice. A positive Corsi Relative% means the player is a positive possession asset to the team (the team has better possession stats when he is on the ice), while a negative Corsi Relative% means the player is a possession liability to the team (better possession stats when the player is off the ice). Vrbata's Corsi Relative% over the last 4 seasons, according to behindthenet.ca, was a +10.7%. I won't lie, that seems rather high, but without ExtraSkater, I'm going to have to believe it. 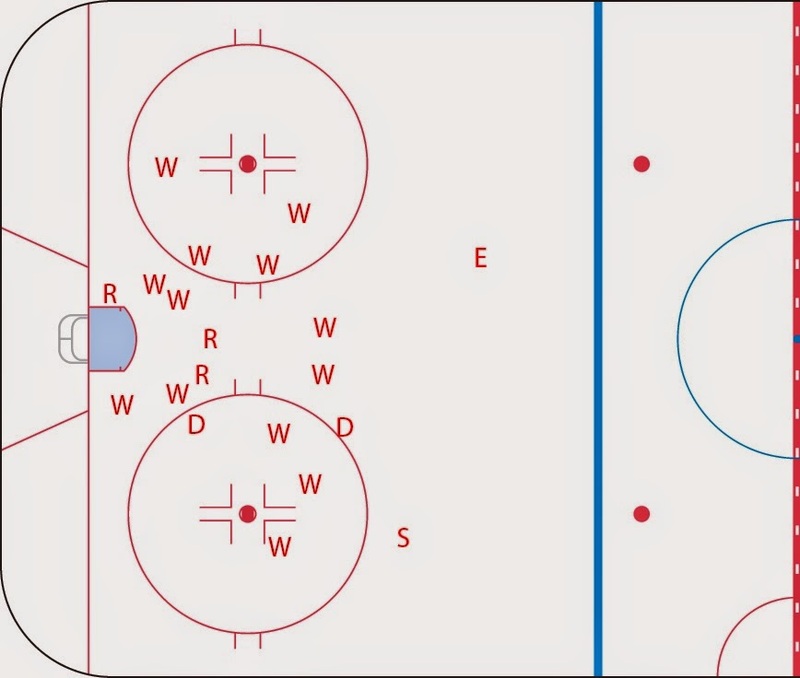 One other way of looking at stats would be using WOWY (With or Without You) stats, which measures possession stats for two players while they are on and off the ice. From 2011-2014, Vrbata's linemate, Martin Hanzal, had a slight inflation of Corsi For% while on the ice with Vrbata. Hanzal had a 47.9% Corsi For without Vrbata, and 52.9% with him. So how does this match up with Vrbata's potential line-mates, Henrik and Daniel Sedin? Well, looking at the Corsi For% of the two as a duo, through WOWY stats, the duo boasted a remarkable 60% Corsi For from the period of 2011-2014. I included the multiple years to try and establish a more credible stat baseline from a greater sample size. Looking at how Daniel Sedin might inflate Vrbata's possession stats even more, we can look back at the Sedin WOWY stats and look at other top line-mates, Alex Burrows and Ryan Kesler. From 2011-2014, when paired with Daniel Sedin, Burrows had a 59.7% Corsi For, and a 54.2% without Sedin. In the same time span, when paired with Daniel Sedin, Kesler had a 58.9% Corsi For and a 52.9% without. These are around 5.5% inflations to possession stats. This would mean that it is not out of the question to see Vrbata with a Corsi For% of roughly around 55% this upcoming season. I know that is a very loose prediction, as Vrbata may not gel well with the Sedins, but these are over the past 4 seasons, so they do carry a bit more weight than just outlier performances for any player, in either direction. So how does Vrbata impact the Canucks offense? In order to accurately predict a number of goals scored by Vrbata, I took the average number of shots/season he had over the past 5 full NHL seasons (so this excludes the lockout-shortened 2011-2012 season), which is 249.4 shots. I then multiplied this by his career shooting percentage, which is 9.3%, and got a rough estimate of goals to expect from Vrbata, which is 23 goals. This is entirely based off Vrbata's own stats, and I have not included any sort of inflation from the Sedins' stats. What this does mean, though, is that if the Sedins have a bounce-back season, mainly Daniel, especially because he suffered an injury in the last game of the season, Vrbata's offensive output will increase significantly. From 2011-2014, Radim Vrbata averaged 0.904 goals per 60 min and 1.855 points per 60 min of 5v5 (even strength) ice time , and 1.78 goals per 60 min and 4.116 points per 60 min of powerplay time. Compare this to Henrik Sedin, from the Canucks, who averaged 0.414 goals per 60 min and 2.193 points per 60 min of even strength ice time, and 1.077 goals per 60 min and 4.489 points per 60 min of Powerplay time (from 2011-2014). From the same time slot, Daniel Sedin averaged the exact same numbers as his identical twin brother, Henrik, as noted above. No, I'm not making that up. So what does this mean? Essentially, it means that Vrbata will inject a dosage of goal-scoring ability to the lineup. Compliment that with the Sedins finding their form again as one of the top-passing duos in the league, and we could potentially see Vrbata score upwards of 28 goals and 60+ points this season. Like I've done in previous articles, I will not go into detail about every single goal of his. I would like to note, though, at how good Vrbata's positioning is, as most of the goals above are a direct result of his positioning. It's also good to note his potential on the Powerplay as well. I'm a very visual person, and I'd like to be able to see from where on the ice a player is scoring, so I decided to try out something new to me (I'm not sure how common it may be among other writers or whatnot) that I would call, Goal Mapping.What I did was take a picture of a hockey rink from this source, peruse through NHL.com's video highlights of games this past season and map out just where Radim Vrbata scored his 20 goals in the 2013-2014 season. What do you folks think of this idea? I know it still has to be fine-tuned. Let's look at where Vrbata scored last season. The dominant theme that can be determined is that either Vrbata is positioned well in the center slot for a rebound or wrist shot, or he is quite good at creating space for himself and skating to a shooting position in the slot. Vrbata has proven to be a 20-goal scorer throughout his career, and now has the chance to play on a line with some of the best playmaking forward duos in the NHL, the Sedin brothers. With his injection of offense and forward depth into the lineup, Radim Vrbata will have "Gold On The Ceiling" playing a lot more in Rogers Arena over the next two seasons. Like what you read? Follow me on Twitter @DTJ_AHockeyBlog or leave a comment! Thanks for reading. Nice breakdown. I appreciate the work you put into this.